Hoot, Hoot, Hooray! is an inspiring chapter book that tells about three different animal rescues. The first is Paul and Babe, two owlets that fell out of a tree. The next story is about an elephant rescue in which an elephant lost his mother due to poachers. The third is about a hurt bear and his road to recovery. Each true story gives examples of what caring, compassionate people did to help the animals survive and live normal lives. They are also an example of how human interaction with animal environments affects the animal populations around them. Whether it be because of logging or for poaching for elephants tusks, the impact of those encounters are great. Also included are appealing photos of each of the animals as well as fact pages and sidebars of information for readers to learn more about the animals in general. Each story is broken up into three chapters for easy reading and understanding, and the back of the book has added information. 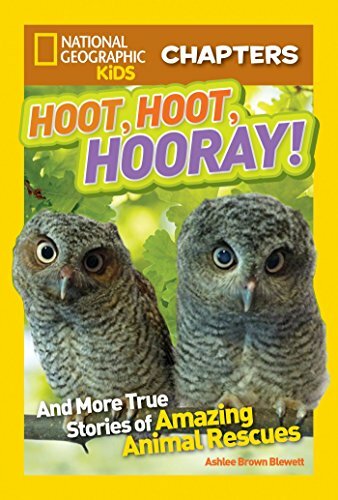 These stories will be inspiring to young animal lovers who are ready for short 112-page chapter books filled with colorful pages, large lettering, and loads of information. The book is broken down for the reader to easily read a chapter or story a day, and each story is unique and different, though similar in nature. These books pick up where the National Geographic Readers Series leaves off, and children who are fascinated with those will definitely enjoy the many books in this series which include horse escape artists, scrapes with snakes, whales, kangaroos, and more.